To truly get to know Yeouido, you would have to visit the neighborhood often season when there isn’t any event taking place at the Han River and when the cherry blossoms aren’t in season. You would have to have lunch with a friend who works in the area and can point out the best restaurants and where they have after-work drinks with a coworker they consider more a friend. A financial district and concrete jungle, Yeouido is a tough nut to crack. Take apart the characters of the name and Yeouido actually means “useless.” During the Joseon Dynasty, a wide grassy area here was supposedly used as a sheep and goat pasture and in 1924, it actually housed the first and only airport in Korea. Thanks to redevelopment efforts by Park Jung-hee in the 1970s, bridge transportation to and from this island became much easier. Nowadays, you can go from Yeouido to Sinchon in approximately 10 minutes by cab as long as there’s no traffic. The neighborhood’s reputation is overwhelmed by the landmarks that it holds–the 63 Tower, the National Assembly of Korea, the Yoido Full Gospel Church and of course, the Han River Park. Exploring Yeouido may not necessarily be for those who only have four or five days in the country, it’s more for weeks-long travelers seeking out a more authentic local experience. Come and let us be your neighborhood friend. There are three major stations that hit the Yeouido area–the National Assembly Station on Line 9 (Gold) and Yeouido and Yeouinaru Station both on Line 5 (Purple). Yeouido and Yeouinaru Station are just one stop away from one another. If the weather is nice and you happen to have a bicycle, it’s also not a bad idea to ride here from the Noryangjin area or even better, the Mapo area. Exit 1 & 6These exits will take you straight to the front of the National Assembly. Exit 2 Walking east from Exit 2 will lead you towards the Han River, but it may not be a straightforward walk. Exit 3This exit will guide you towards Yeouido Han River Park. Exit 4&5These exits will take you straight outside of Glad Hotel, which is located in front of the KBS building. Exit 2 & 3 : Walk straight out of Exit 2 for the main entrance of Yeouido Han River Park. If you make a right at Exit 3, you will also see the IFC Mall. Exit 4 & 5 : These two exits will lead you towards the Han River. Exit 6 : This exit leads you towards a more residential area of the Yeouido area. It can be easy to get lost at this exit. Tip : If you’re headed towards the Hongdae or Hapjeong area with a group of friends, it may be less trouble to just take a taxi or bus from Yeouido. However, avoid taking the bus at all costs if there is an event going on. The traffic is really not worth all the trouble! 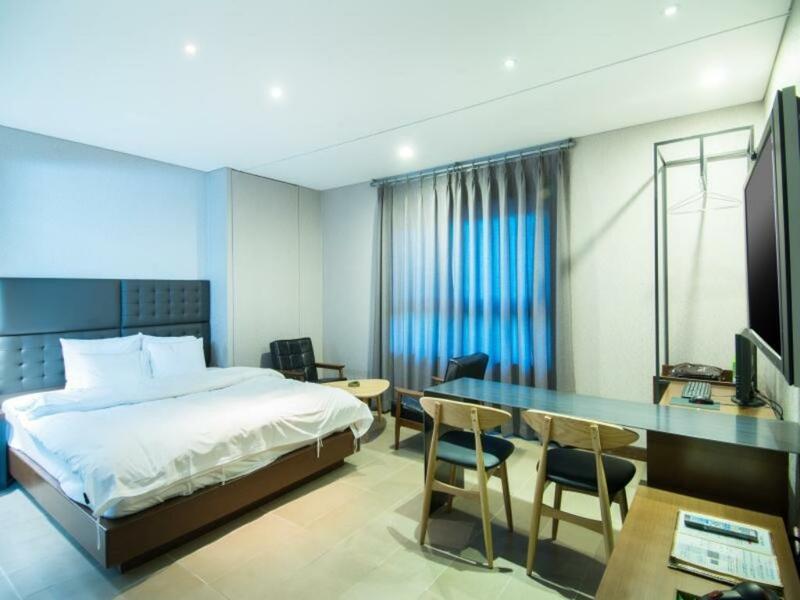 Catering to many businessmen and potential clients that fly to Seoul for meetings, Yeouido has a great variety of hotels that are equally loved by locals. 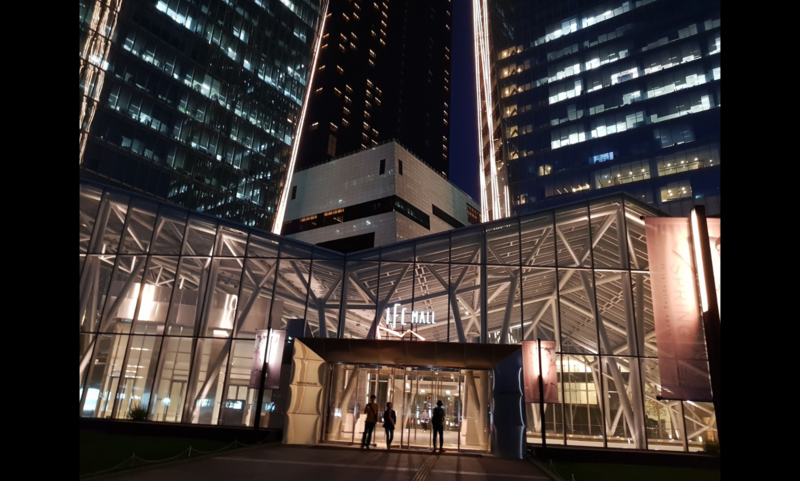 While these hotels are definitely not for those on a budget, you can choose to stay here on a splurge night or if your trip to Seoul coincides with a special event–especially if you’re coming with a romantic partner. 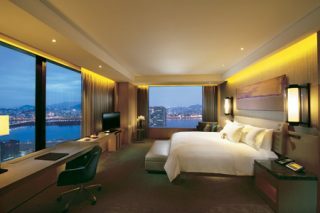 Expect grandeur designs, top-notch service and panoramic views of the Han River. 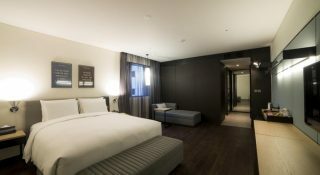 Conrad Hotel is one of the newest luxury hotels in Seoul, so everything is clean and sleek with the luxury service and amenities that other hotels simply cannot offer (such as fitness center, swimming pool, hot tub, sauna, yoga room). It’s also one of the tallest hotels in Seoul and it overlooks the Han River, so you’ll get one of the most coveted views in Seoul as well. 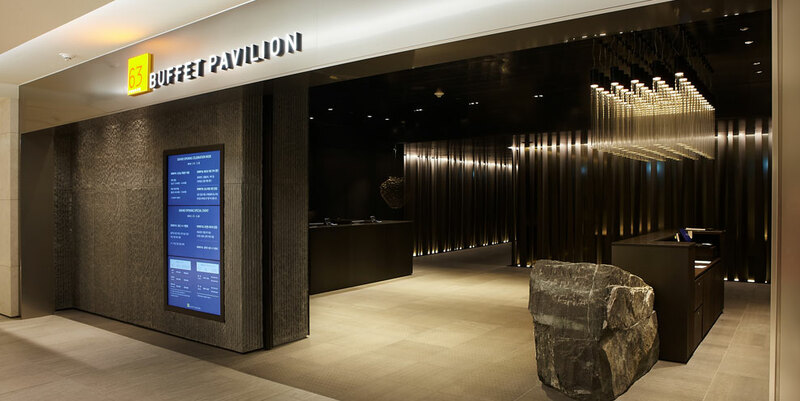 It’s also extremely convenient as the hotel itself is built on top of IFC Mall and has direct underground access to Yeouido Station (Line 5 & 9). 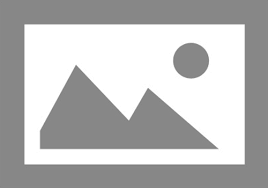 Glad Hotel is a stylish, clean and modern hotel with a central location. The hotel was renovated in 2014, so everything is still very new, and the room itself is perfect for those that want a comfortable stay. It’s perfectly located with a 1-minute walk in front of Line 9 (National Assembly Station), a 5-minute walk to one of the most immaculately maintained parks in Seoul, and a 7-minute walk to the activity-filled Han River. 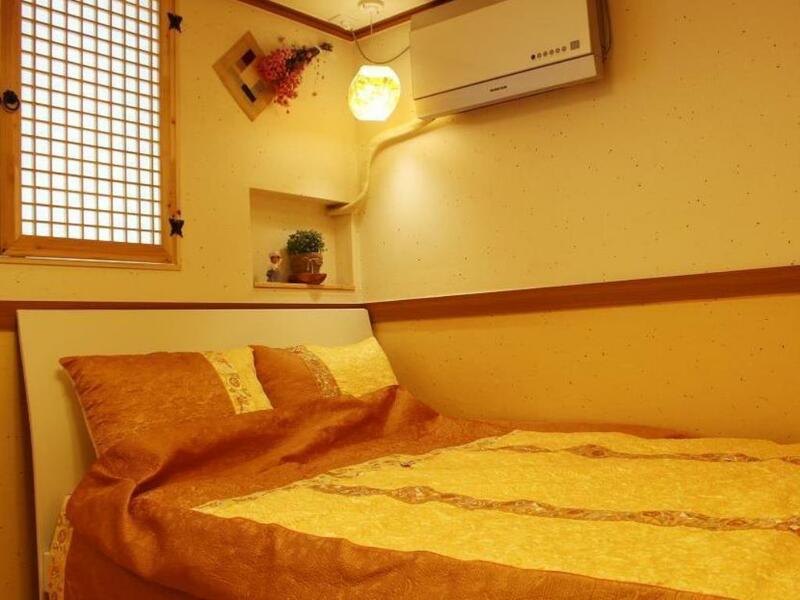 A small house located just five minutes away from the subway station, this guesthouse only has three different types of rooms– single room with private bathroom, double room with private bathroom and a family room with a terrace that can occupy 12 people. Albeit small, the rooms are clean and well-designed. It’s a great option if you’re traveling alone and need your space or if you’re coming with a large group and you’re on a budget. 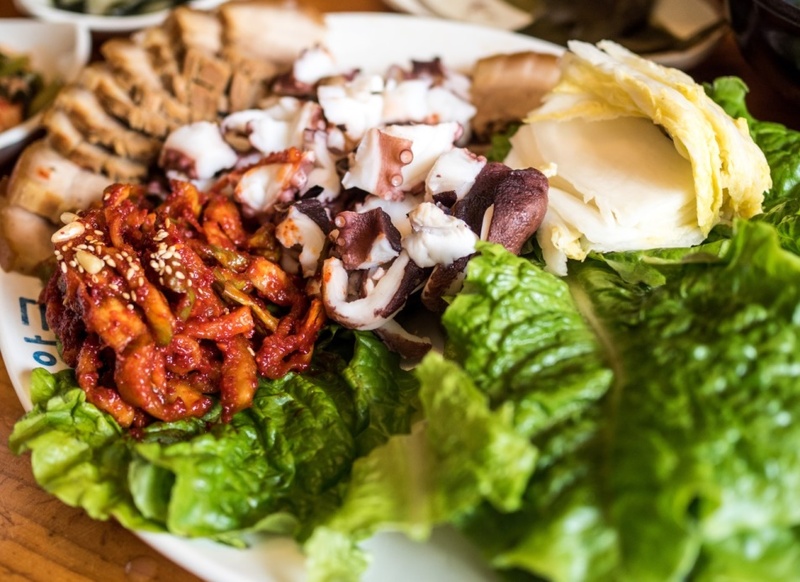 In Korea, it would be rare for a local to go out of his or her way to go eat in Yeouido. It’s not necessarily the foodie-capital of the city. Most of the people dining here are businessmen and women suited up for the day. Go to a restaurant where you have to take off your shoes and you’ll be amazed by combination of patent leather shoes and Adidas house slippers (many company workers wear slippers at work). It’s a sea of black, white and sometimes navy, and you in your blue jeans and sneakers might find it an out-of-body experience. 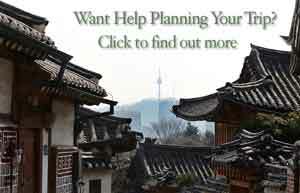 Come and watch day to day Korean life as it unfolds! Located on the 59th floor of the famous 63 Building, this restaurant boasts itself as a “premium buffet.” With seating for over 500 people, it is the largest buffet in Korea. A variety of Western and Eastern cuisines are available and there are over 200 dishes at the restaurant. Since the kitchen is directed by several award-winning chefs and there are many special guests invited to dine here, you can expect to have high standards for the food. These businessmen know how to eat, and they have great taste in noodles. Reserve in advance for a view at the window since it is quite exceptional. Ilho Myeonok (일호면옥). 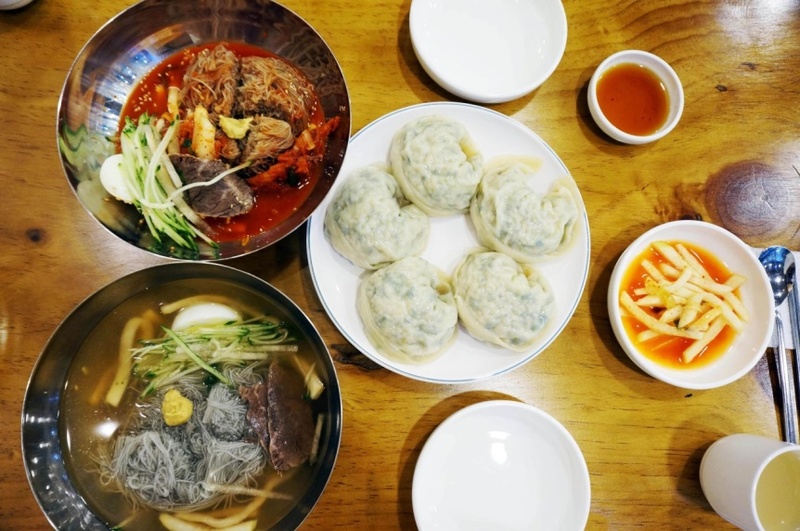 A lesser-known noodle joint in the Yeouido area, the specialty here is Hamhung naengmyeon or iced noodles from the Hamhung region of North Korea. The raw fish naengmyeon is especially sought after, and many people say that the spiciness of the flavoring in combination with the thin, chewy noodles is particularly addictive. Hadongkwan (하동관). The popularity of the original location in Myeongdong inspired this branch here in Yeouido. The specialty dish here is gomtang which is beef broth, rice and slices of beef. 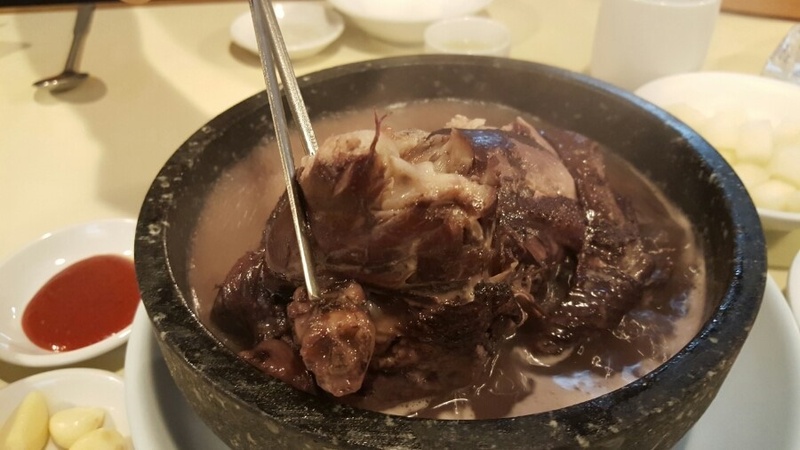 As is the branch’s signature, the soup here is special, as it’s filtered for a clear and refreshing taste, as opposed to the cloudy soups of other gomtang restaurants. The restaurant also provides large slices of high quality hanu meat, which is in contrast to the smaller slices of other restaurants. Hadonghwan definitely has become a favorite amongst the office workers in the area on cold, winter days. The gomtang is available in two different sizes–regular and special. Note: There’s another Hadongkwan in Myeongdong. Hyangto comes from the Korean word for rural area and this Yeouido restaurant definitely draws inspirations from countryside eating. One of the most popular dishes here is the maesaengi soup– a soup that’s part seaweed, salt and water. The soup exists with a few different variations and is loved for the freshness of its simple ingredients. Jinju-jip (진주집). Although there’s nothing fancy about this restaurant’s interior, there’s one dish that keeps all the foodies coming back–the dakkalguksu (knife cut noodles with chicken). 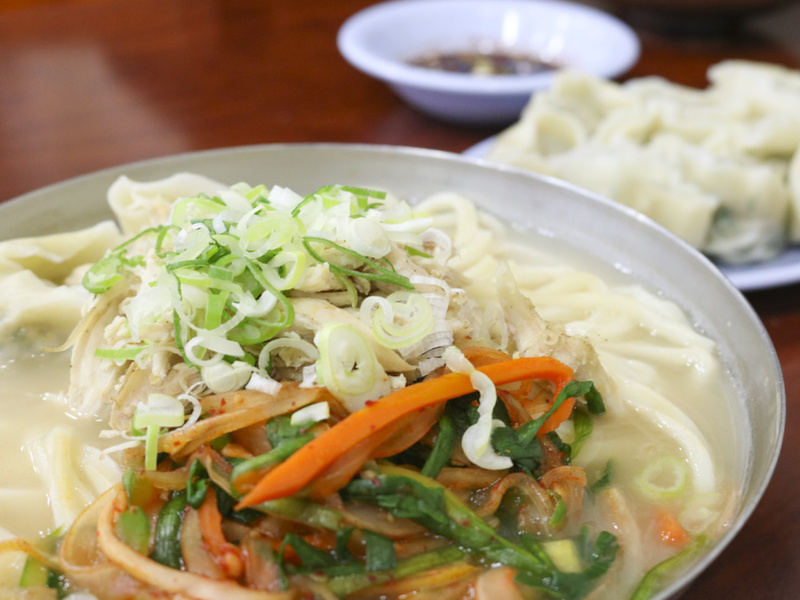 The savory soup in combination with the restaurant’s killer kimchi makes it a favorite amongst the broadcasters at KBS nearby. Pahnaks (파낙스). 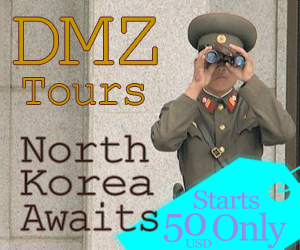 Tired of the long lines of tourists at Tosokchon? Don’t forget that there’s more than one place for samgyetang (herbal Korean chicken soup) in Seoul. This 30 year old restaurant in Yeouido has a few different takes on the dish including chalheukmi-samgyetang (herbal Korean chicken soup stuffed with black rice) and ddeulggae-(wild sesame) samgyetang. Both are great ways to boast up your healthy samgyetang so go ahead and eat with the locals! 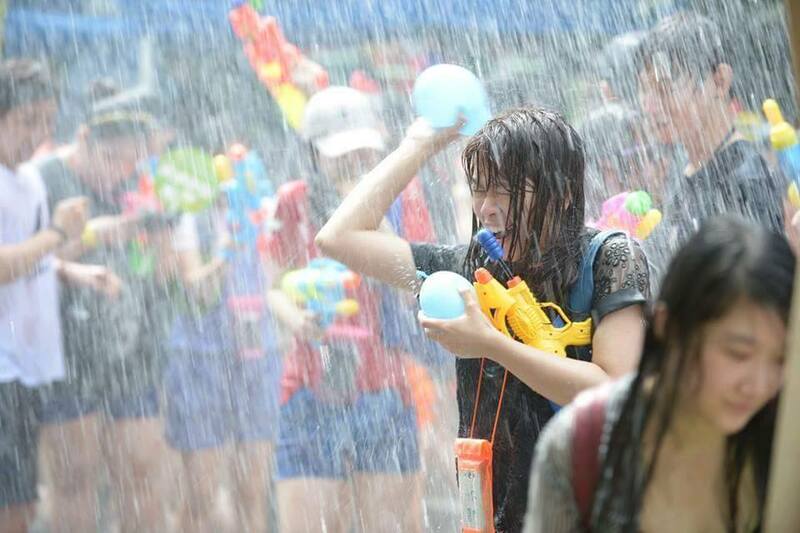 Okay, we admit that there’s not too much to do in the Yeouido area other than going to the Han River. But if you’re looking to add one or two things to your itinerary after hitting up the park, then here are some of your best bets. 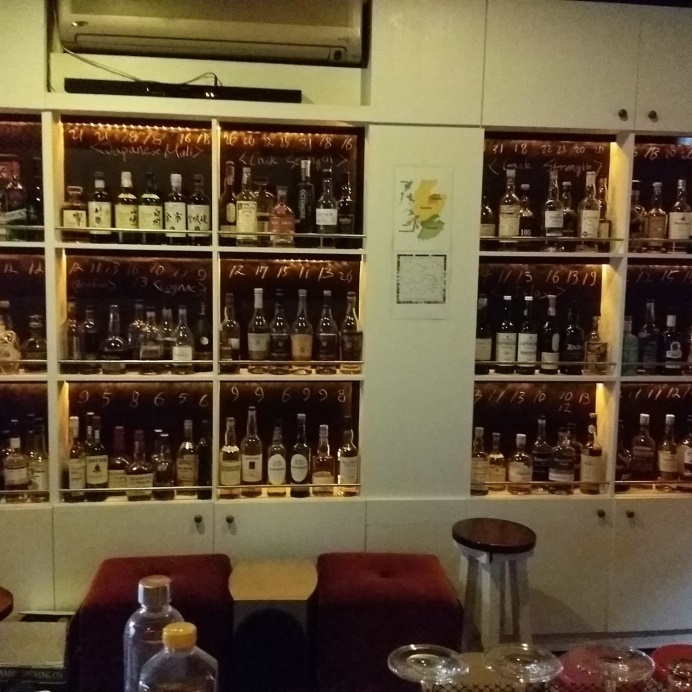 With so many hidden bars in the Yeouido area, it can be hard to know which are the best places to have a drink. There are plenty of izakayas that serve fresh sushi and sake, as well as ridiculously overpriced one-room bars with scotch and whisky. For delicious cocktails and great interiors, check out these bars. Open only for the warmer weather months (and closed on rainy days), Vvertigo is Conrad’s rooftop bar that serves simple bar food and drinks. Having a drink on either the sofa or the patio and enjoying the excellent hotel service is a relaxing experience during the nice summer months. Surrounded by giant buildings and a view of the Han River in the distance, Vvertigo can give off an ethereal feeling–and it’s not because you’ve had one too many drinks! Check out Glenwood in the Yeouido area and you’ll find the trend of drinking alone in full swing. A whisky bar with a simple interior, you’ll find the menu written in chalk behind the bar and table seating off to the side. The bar is much more laid back than other whisky bars of that standard, so you can go ahead and settle in with that Old Fashioned. Find out a little bit more about these Yeouido landmarks and it’ll make your selfie slightly more informed and all that more special. Officially known as the Hanhwa 63 City and also referred to as 63 Square, the building designed by American firm Skidmore, Owings & Merrill is the tallest golden-colored building in the world and was once the tallest building outside of North America. It’s a particularly noticeable structure, even from across the Han River and especially when crossing the nearby bridges. Within the building, there are a slew of attractions such as a variety of restaurants, an aquarium named 63 Aqua Planet, the 63 Sky Gallery which provides panoramic views of the city, a wax museum and an IMAX theater. Of the attractions, the 63 Sky Gallery is one of the most loved for its collection of art and its price. 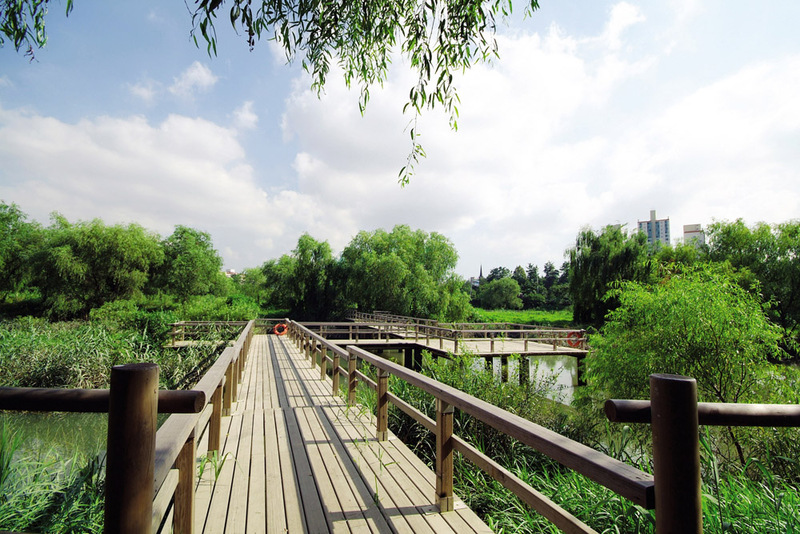 A park to visit for those who care about the environment, the Yeouido Saetgang Ecological Park is actually Korea’s first ecological park. Housed within the park is a variety of flora and flauna, explanations about the plantlife that it holds as well as a beautiful little bridge. 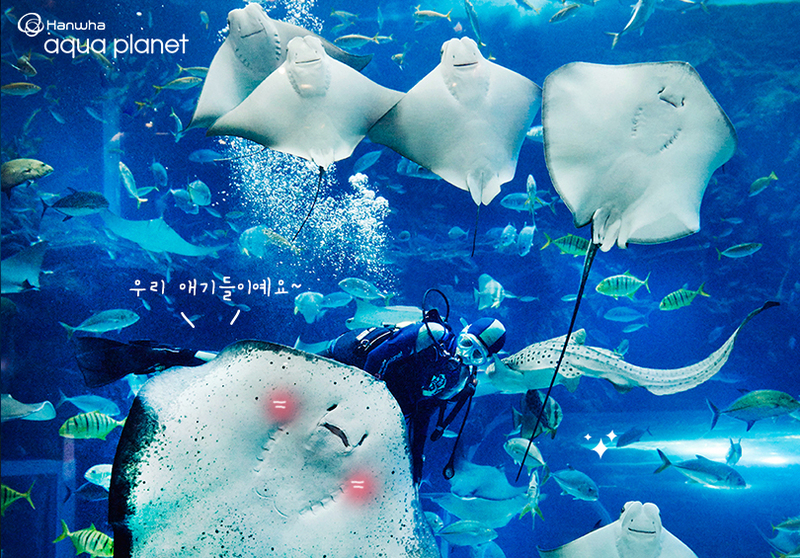 It’s considered a high success in Seoul’s green efforts. 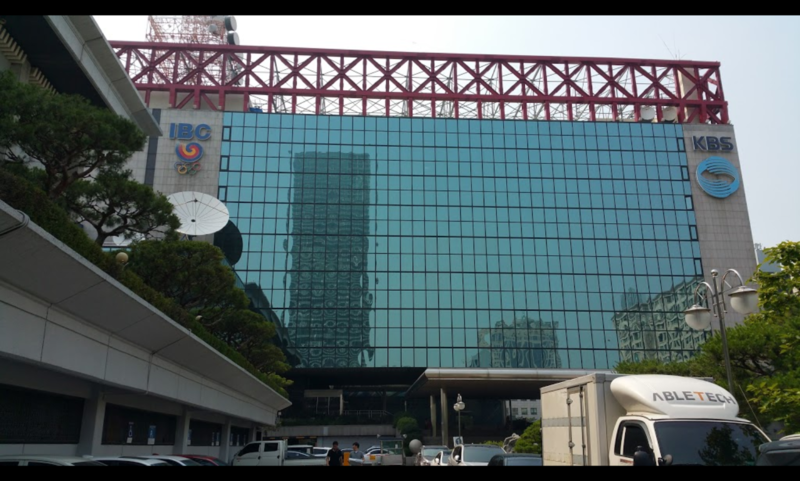 Interested in Hallyu and care to know more of how Korean broadcasting got its footing? Make sure to check out the KBS On Museum within the KBS studios. The museum includes a 3D TV Experience Center, a radio booth and some of your favorite KBS characters in addition to many hands-on experiences. You can practice your news anchor skills and try out your disc jockey skills. Reservations are required for parties for 11+ people and they can only be made in Korean, two months prior to your visit. Known in full in Korean as the Yeouido region of the Han River Citizen’s park, the comprehensive green space has 12 different districts located all throughout the city. Among the districts, the Yeouido branch is one of the best known for its wide, flat space and the cherry blossoms in full bloom during the spring. Opened in 1999, the park hosts a wide variety of events throughout the year and depending on what event it is, it can take center stage of the park. However, if you happen to be visiting during a non-event day, there’s still plenty to do. According to the Korea Tourism Organization, there are four sections to the park: The Traditional Korean Forest, Grass Square, Culture Square, and Nature’s Ecosystem Forest. 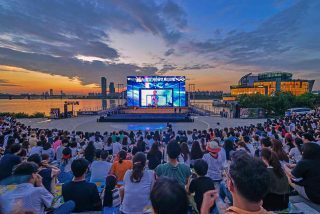 A Hangang River Ferry Cruise can take you on a 30-minute route passing Seongsandaegyo Bridge or on a 70-minute route passing the Banpo Bridge. The Grass Square is dotted with picnics during the spring and summer and people often order fried chicken, play music and hang out by the river in this way. There is an outdoor swimming pool open for the summer months in addition to a skating track, a small golf range and a soccer field. An outdoor basketball court for shooting hoops is located at a corner of the culture square near Gate 6. Bicycle rentals, which have now become more accessible through the Seoul Bike system, were once spotlighted at Yeouido park and is still an extremely popular function of the park. 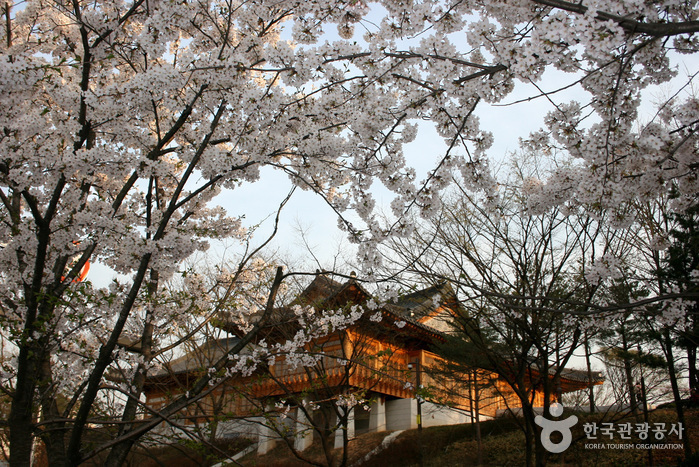 There are also plenty of walking routes if you're looking to take it easy and the Samojeong Pavilion is a beautiful photo opportunity. Make sure to stay hydrated by picking up some water at one of the many convenience stores available, and don’t out on miss a big event because you’re at a different corner of the park! The word bamdokkaebi comes from the Korean for night monster, but it might have been better if they had found a word meaning “night foodie.” A weekend-night market that typically opens from March to October, the Seoul Bamdokkaebi Night Market has a growing number of food trucks serving different kinds of cuisine. Typical Korean street snacks such as tteokbokki and kimbap can be found here in addition to fusion and international eats like KoMex tacos, banh mi and American-style barbecue. Craft beer and cocktails to go with your snack are also available. 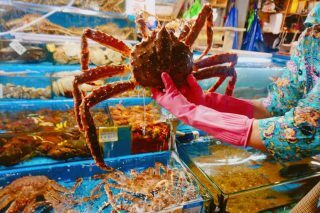 Small vendors selling handmade crafts and staged concerts are also there, but let’s face it– it’s all about the food! 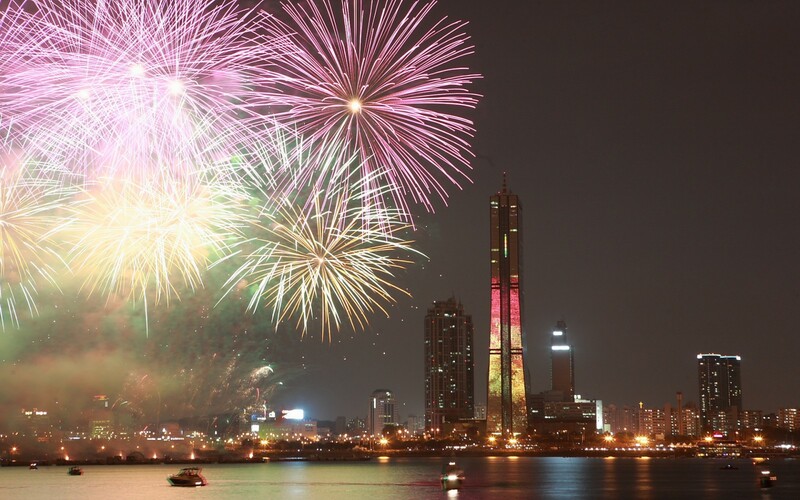 The Seoul International Fireworks Festival is one of the biggest fireworks festivals to take place in Seoul and takes place over the course of eight hours in one day. Sponsored by the Hanhwa company, the festival sees more than 120,000 visitors per year (and that’s only including the people on the grounds). Visiting the actual park sees some traffic problems for those with cars and going to the bathroom, especially for women, can be incredibly tiresome. If you are a fan of fireworks, get to the park early for a good spot or splurge on a nearby hotel for the night (and reserve in advance).